Sauté the red pepper for a couple of minutes just to soften a bit. Remove the sausage from casings, crumble and brown keeping the sausage slightly underdone adding garlic for the last-minute. Remove from heat. Whisk the eggs with the salt, pepper, mustard and any other seasonings that you would like to add. My Italian sausage is pretty flavorful so I don’t need but a pinch of my seasoning for a little boost in flavor. 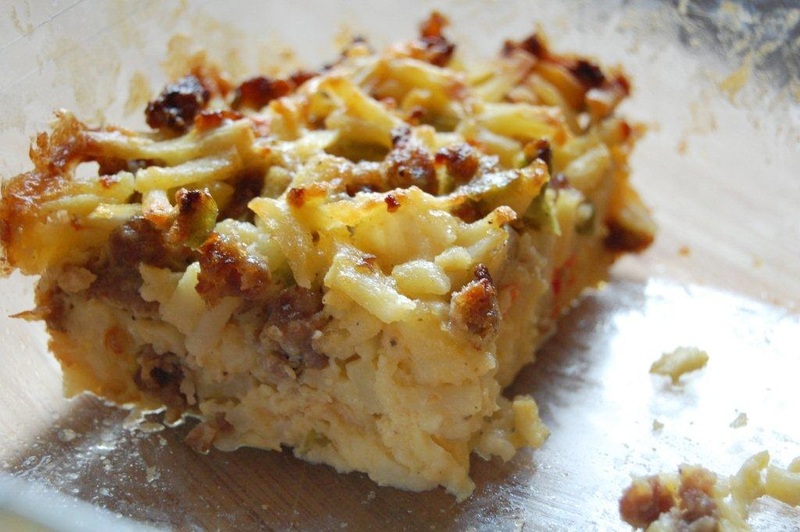 Grate the cheese and add into the eggs, toss in the sausage, break up the frozen potatoes into a buttered baking dish and pour the egg and sausage mixture over, folding the whole thing together until thoroughly blended. Bake in a 350° preheated oven for about 50 minutes; allow sitting time for several minutes before cutting and serving. Serve with a tropical fruit salad and hot sauces for those who like an extra kick. I love the crispy corner piece…dibs.